The generally accepted belief is that roll out of GST would lead to elimination of delays and long queues at checkposts at state borders. It would also lead to the simplification of the documentation required for transporting goods across India. These are important objectives given that India has notoriously high average waiting time and stoppages for trucks transporting goods. 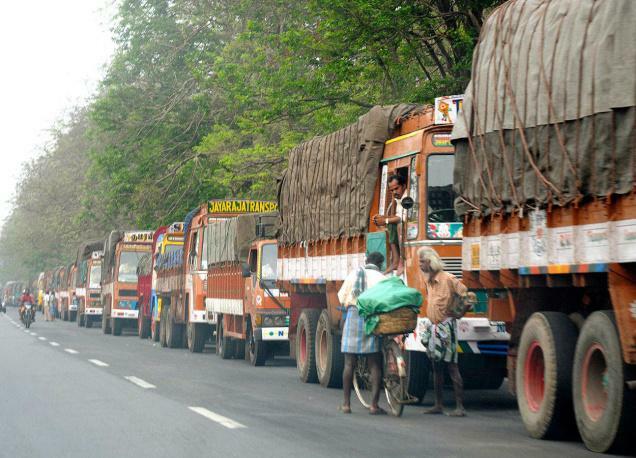 According to a recent report published by Transport Corporation of India (TCI) and IIM-K, such delays impose transaction costs of around $21 billion annually on India’s businesses. In addition, it increases average transit times and makes supply chains inefficient. Enabling seamless movement of goods across India is, in fact, is considered to be one of the most important aspects of GST-related reforms. It would lead to much-needed logistical efficiency in India’s national supply chains. This would require detailed rule-making as well as IT-based systemic solutions acceptable to all stake-holders, especially the State administrations. Unlike the political and tax law related debate over GST, rules for transport related documentation and administrative procedures for checking and inspection of trucks have received relatively scant attention. At present, State governments maintain a plethora of forms (many but not all online) for both the consignee/consignor of goods and the transporter to file for recording the movement of goods in and out of their jurisdiction. Existing procedures also require transporter to carry hard-copies of invoice and forms along with them. This system can easily be replaced by designing single national online documents for the consignee, consignor and transporter. The national document for consignee-consignor will require submission of the same information that is currently captured in a standard invoice. For every transaction, consignee-consignor will have to also provide a corresponding invoice number reference from his books of accounts. This would comply with the legal requirement of the GST model law that transport can only happen after invoicing of goods. Provisions for special types of transactions (for example, imports, repair and return or stock-transfers) or special types of goods (for example, exhibition goods or documents) need to be made. The online system would generate a unique transaction ID for every transaction. The transporter would create an online electronic waybill (e-waybill) by simply quoting the transaction IDs generated by consignee-consignor and adding the registration number of the vehicle that would be transporting the shipments quoted in the e-waybill. Each e-waybill will be assigned a unique ID, and all the transporter would need to have with him is this number, which he would quote to any official en-route who wishes to establish the bona-fides of goods being carried. The GST Network or GSTN should be able to provide this IT architecture, with adequate server capacity. Not only will this make the documentation simple and transparent, it would do away with the need for the government to chase paper-trails (of invoice copies and multiple documents) when it requires to do due diligence and post audits. In a truly integrated India, with one national GST, checkposts at State borders need to be completely eliminated. In order to ensure compliance with tax laws, the government can put in place a system of randomised checks by mobile flying squads. However, there is concern that such mobile flying squads can become a source of harassment for transporters due to over-zealous or unscrupulous officers. Officers have been given substantive powers under the draft GST law for stoppage and seizure of vehicles which can be potentially abused. Annual report, reporting stoppage data, sorted by different sections of route, to be published based on the database maintained by the government. Finally, a system of registered transporters should be encouraged. Transporters with a good compliance record could be provided a higher level of facilitation and enable authorities to develop a better risk management system targeting less compliant players for higher number of checks. Without such comprehensive IT backed documentation, procedural, and administrative reforms, and adequate checks and balances, the benefits of GST would be incomplete, as would the dream of seamless movement of goods and efficient supply-chains in India.